We are proud to announce a dance workshop to be held at the Kinosaki International Arts Center by dancer Maki Morishita during her residency stay! 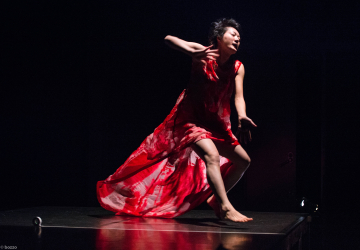 Before arriving, Morishita has performed a solo piece in 10 different countries and over 30 different cities. Dancers from the Morishita Stand dance company, which Morishita presides over, will also be in attendance as her assistants. Morishita grasps that, at its core, “dance is a form of play through which one connects with others.” Even if someone is not technically experienced in dance, they can still join in through an innate sense of playfulness! Having the opportunity to dance alongside professional dancers is a valuable experience, so please come join us if you’re up for it! ■Reservation: Please contact the number or the email address below and give the title of the event, your name, the number of people attending, and a contact number.